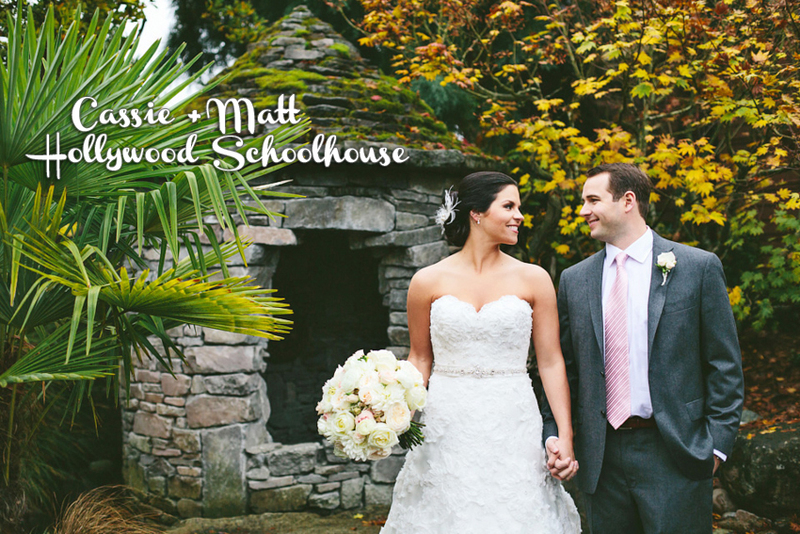 Cassie and Matt were married in a stunning ceremony and reception at the vintage Hollywood Schoolhouse in Woodinville. These two fun-loving sweethearts didn’t want to worry about a thing on their wedding day, so they left the details in the very capable hands of their planner, Tamara Nicole, who flawlessly put together the perfect party. In a recent blog interview, Cassie gives the following piece of advice to other brides about hiring a planner, and we (from personal and professional experience) wholeheartedly agree! My favorite thing about the wedding was that I literally didn’t have to worry about ANYTHING other than getting beautiful and marrying my favorite person in the whole world. I loved that I didn’t have to delegate duties to my family and worry about whether they were getting done or not. If there were any issues, I never heard about them! I also LOVED my candy/dessert table designed by Tamara. It was a major hit with all of the guests! My best piece of advice is to definitely hire a wedding planner, as it is worth every penny. Even if you only hire them for day of, you will not regret it. 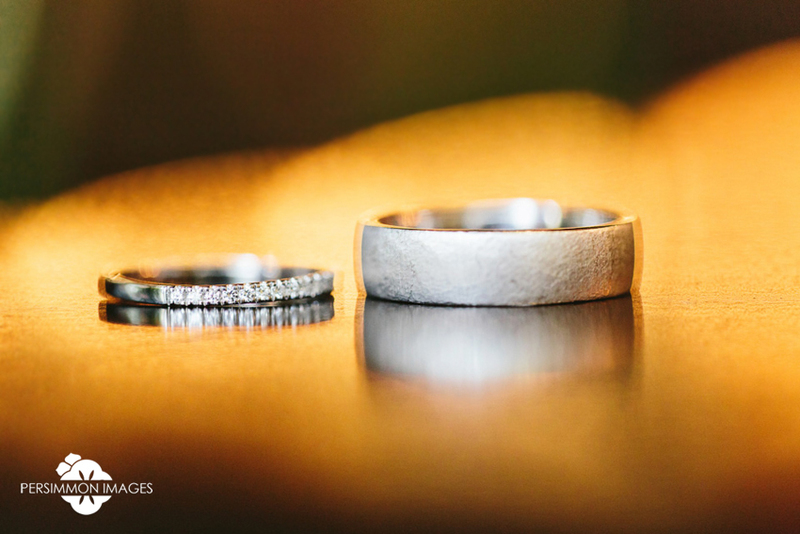 The last thing you want to do in the days leading up to the wedding is worry about schedules, vendors, etc. On that day you should have as little stress as possible and only focus on having the time of your life! Also, don’t stress the small details. 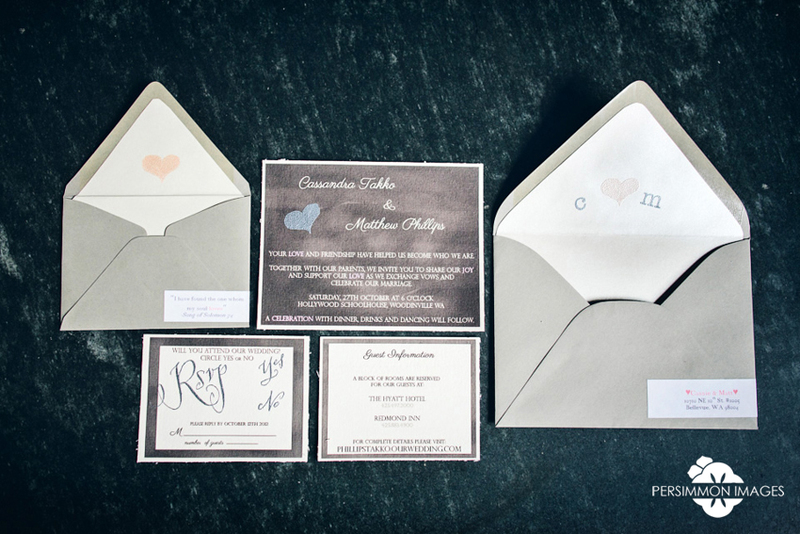 Your day will be so busy that you will not even notice them on your big day! Cassie and Matt’s beautiful vintage blush and silver Hollywood Schoolhouse wedding was recently featured on Every Last Detail, and I am so proud to show off even more of their never-before-seen photos here. The couple completed their wedding day preparations at the beautiful Willows Lodge, then humored the rainy forecast by incorporating college-team rain boots and umbrellas into their portraits with the bridal party. Though the clouds were dark that day, they didn’t dampen anyone’s spirits. Cassie and Matt’s heart-lifting ceremony was bright and airy, officiated by a good friend who brought laughter and tears to everyone witness. A spirited cocktail hour at the on-site old-timey bar was followed by a gorgeously appointed reception complete with glittering tablescapes wrought with old books and advice to the couple. The piece de resistance? A dessert bar piled high with cupcakes, candy, and a dreamy “cutting” cake for the bride and groom. Congratulations, Cassie and Matt, on a wedding well done! We’re so glad to have been there to celebrate with you, and to have just had the occasion to photograph the newest member of your family, baby J! We’re so happy to know you and have you as a continued part of our lives. Want to see more photos? Watch their full Woodinville wedding highlights slideshow and their Bellevue & Marymoor Park engagement photographs! For their long-anticipated wedding, Liz and Aaron wanted to share with their guests the sights, sounds, and seaside scents of one of the most historic locations in the San Juans — Roche Harbor Resort— a beautiful, quintessentially Pacific Northwest getaway. For two self-described “decidedly unromantic” people, they put together a weekend destination wedding that was a heartfelt and memorable celebration of their commitment for everyone who attended. Many of the details were handmade: Liz and Aaron designed their Chuppah, programs, and menus with signature touches. To customize their reception, they marked each table with an antique postcard of a notable location they have been– complete with the story of their trip written on the back, and then called each guest to their table using a vintage map. Their beautiful color scheme complimented the landscape of blues and greens and a pop of orange provided a bright contrast to the rainy day outside. And, boy, was it ever a rainy October day. Their ceremony, set to be held in the lovely outdoor gardens, was moved inside to keep everyone dry, but it didn’t dampen their spirits at all. For us, thanks to a to-the-minute weather doppler app called “Dark Sky,” we were able to choreograph outdoor portraits in-between downpours, and everyone was happy! (Shh, by the way, Dark Sky is a trade secret! 😉 The rain gave a peaceful, subdued mood to the sleepy resort town, and gave the seaside air that special Northwest coastal feeling. I think a bit of weather sometimes makes a wedding day even more beautiful. Finally, one of our favorite local entertainers, Michael Benson Band, made Liz and Aaron’s wedding reception a party to remember. Their live rendition of the Hava Nagila was so energetic and intense that every single guest was on the dance floor — I’ve never seen anything like it! Liz and Aaron, congratulations on a wedding well done! We’re so happy for you, and to be a part of the life you share. Congratulations again! Want to see more photos? View Liz & Aaron’s Roche Harbor Wedding Slideshow or take a look at their Green Lake engagement session!